Antique Lace Trim Wide Edging Shamrocks clovers Flowers 1 yard x 10"
This is a antique early machine made lace trim that features a shamrocks clovers & flowers pattern. Also there is a opening to thread a ribbon through the antique lace trim. 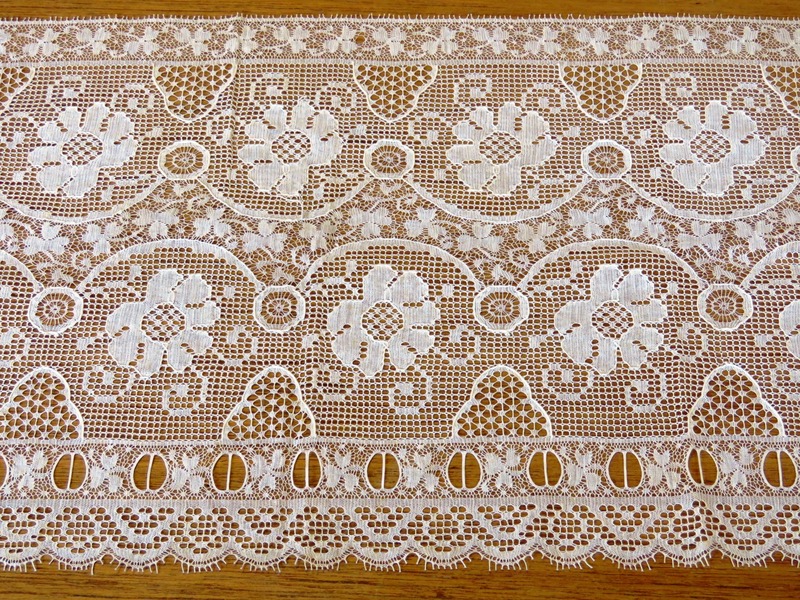 Antique Lace Trim Measurement: length 1 yard x 10" approx. Color: dark champagne (see photos). Antique Lace Trim Condition: The antique lace trim looks unused however there are several tiny rust spots on the antique lace trim (see photos). There is also a tiny hole at the top of the antique lace trim. The antique lace trim is in "as found condition" in that I have not washed it.